Is Rand Paul doing a 'better job' than his father? Impossible to answer. They are simply different. Building 7, Sandy Hook, Anderson Cooper's disappearing nose! Without Ron Paul – Rand Paul does not exist in the political world… I would say Ron Paul is right about his son with that statement, But its in terms of being a “politician” and playing the game to get what you want… And in our terms what we want is LIBERTY!! Ron would say in multiple speeches that they (neocons) would come to him and say ” Ron we love you alot and what your bring to the table and BOY you would really do alot better if you just changed your foreign policy” Ron Paul a man of principle responded “We would not be here today” speaking to an overcrowded area “If it wasnt for my Foreign Policy of peace” Rand Paul is no Ron Paul but he without a doubt play politics better than Ron ever could and that goes to show you the principled character of Ron Paul..
Ron Paul was never a politician. He was a Statesman to be sure. Rand Paul is a politician, no doubt about that. Exactly. Let’s not pretend Rand is trying to be the principled educator Ron is, nor that Ron was realistically expecting to have a chance to be president. 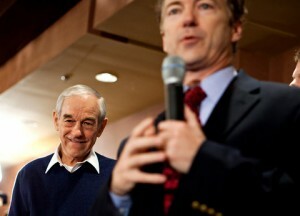 Without Ron Paul, Rand Paul doesn’t exist, period. Rand and Ron are the most beautiful people in public office; they want to create the world that they BOTH imagine. Too many people are pessimists about people of liberty while they’re optimists about large government or the will of the majority.